Probably the first thought that crosses your mind when you discover that you have a mold problem is, “how much is it going to cost to have this mold removed?”. It’s a natural question to have, and we understand why you’d immediately head to Google to start researching the cost of mold removal and remediation for your home. I wish I could give you a simple answer that says how much mold removal costs per square foot, but I can’t because each mold situation is unique. However, what I can do is give you some tips and ideas of a general cost range that you can use as a reference as you search for a professional mold removal company – like MoldPro LLC. Just like when you need to replace a furnace, hot water heater or major appliance – you probably don’t just buy the cheapest option available to you. Why? Because usually the cheapest replacement isn’t going to provide a quality, long-term solution. Another way to say it is – you get what you pay for. It’s the same with mold removal companies. Any company who is quoting or advertising the cheapest mold remediation in town more than likely isn’t providing a lasting and long-term solution to your mold problem. In my experience, the companies or contractors that are providing these ‘cheap’ services aren’t doing the best job possible. For example they might skip the all important air, surface and independent lab testing that is critical to successfully remediate mold. Some of these companies will also ‘fix’ your mold problem simply by covering the mold with chemical-heavy encapsulating paint. While this paint may cover the visible mold, it does not address any mold that can’t be seen growing behind drywall or under carpet. So while hiring one of these companies won’t cost you as much up front, the odds of your mold problem coming back again and costing you more in the future is quite high. Ok, so how much does mold removal really cost then? Because each mold issue is different you need to understand that where the mold is located and how much of it there is factors into the overall cost. Mold located on walls and floors due to flooding, in air ducts, crawl spaces or attics – all require different remediation methods and each have unique challenges that affect the overall cost. Depending how big the area is, removing mold from a crawl space may cost anywhere between $2,500 & $5,000. Many factors come in to play when dealing with mold in an attic such as the style and type of trusses, spacing, pitch accessibility and the extent of the work all factor into pricing. As an example some people simply want their attic ice blasted, others want ice blasting, vents, insulation removed and other additional services. So it might cost between $2,400 & $4,900 to remove mold from an attic space. The most challenging area to predict a cost range on is a basement. Square footage, finished or unfinished, how hard or easy it is to get to the mold, type of floor joists, ceiling height, whether the concrete needs treated as well as other factors all contribute. What should I consider other than cost? 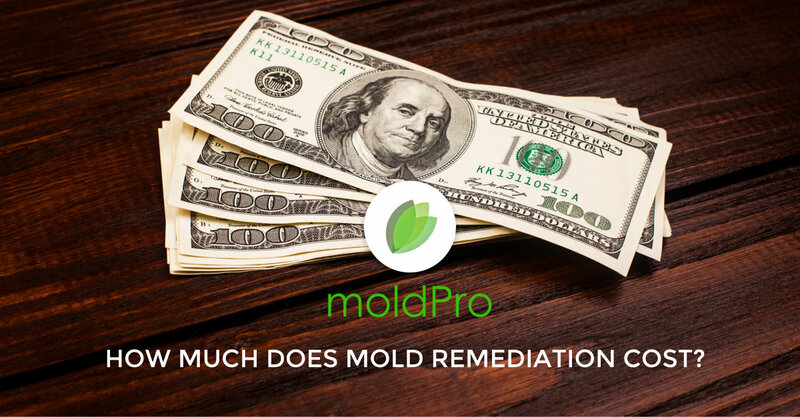 While the cost of mold removal is important in making your final decision, you should also take into account the experience, the customer reviews and the mold remediation process of the company or contractor you’re considering. The reality is that today, just about anyone can buy $500 worth of equipment and chemicals and call themselves a “mold removal contractor”. A very important question to ask any company that you’re considering is how long have they been actively in the business of mold remediation? You should also look at the company’s Google Reviews to see what kind of customer feedback they’ve received. As consumers today we rely heavily on reviews of products and services to help us make an informed decision before we spend our money. Mold removal and remediation is no different. If the company you’re considering doesn’t have an up-to-date, professional website and have at least a few positive reviews – then you’d probably want to move on to another company. Another thing you should do, whether it’s on the phone or during an in-home consultation, is ask questions…a lot of questions and make sure you’re getting detailed answers in return. Ask questions about the process they’ll use to remediate the mold. Ask if they provide before and after air testing as a part of the overall process. You’ll also want to ask what their certifications are. Believe it or not, some mold remediation companies don’t have anyone on staff who is even certified for any facet of mold remediation. At MoldPro LLC we have multiple certifications, are properly insured and are Michigan Licensed builders. And lastly, and even most importantly, ask if the company uses chemicals in their mold remediation process. The chemicals that some mold removal companies use are highly toxic, and can actually pose a greater health risk to the residents of the home than the mold by itself. Here at MoldPro LLC, we’re Michigan’s leader in chemical-free mold remediation. Our dry ice blasting process is safer for your home and family. This chemical-free process has been proven effective to remove mold while leaving no noxious chemical footprint behind in your home. I hope I’ve given you enough information to help you make an educated decision when choosing a professional mold remediation company. If you have any questions, feel free to comment below or reach out to us directly. We’re always happy to help! I really like that you say to look online at their reviews and see what kind of feedback they have received. It would be nice to talk to these past customers as well, and ask them some questions you may have. Since you will be paying them to get something out of your house, it would be nice to make sure they are going to do it right.